The 2030 Agenda for Sustainable Development provides a shared blueprint for peace and prosperity for people and the planet, now and into the future. The Sustainable Development Goals (SDGs) recognize that ending poverty and other deprivations must go hand-in-hand with strategies that improve access to water, sanitation and hygiene; health and education; reduce inequality; and spur economic growth, among other transformations. In the 17 set of goals, people are central and foundational. There are people around the world who are still in need of the most basic necessities of life – everything from clean water to food, and healthy lives and well-being. More than any other goal, Goal 6 – Clean Water and Sanitation, is one of the most interconnected goals. Undoubtedly, increasing access to water, sanitation and hygiene (WASH) aids economic development, poverty reduction, education (particularly for girls), health and many more. As we speak, it is estimated that 60 million Nigerians live without clean water, 120 million lack access to decent toilet facilities and 46 million practice open defecation. More disturbing is the fact that annually, about 60,000 Nigerian children, under the age of five, die of WASH-related diseases. This implies that with 12 years left to the attainment of Vision 2030, Nigeria will find it difficult to achieve #SDGs Goal 6: Ensure access to water and sanitation for all, if nothing is done urgently. 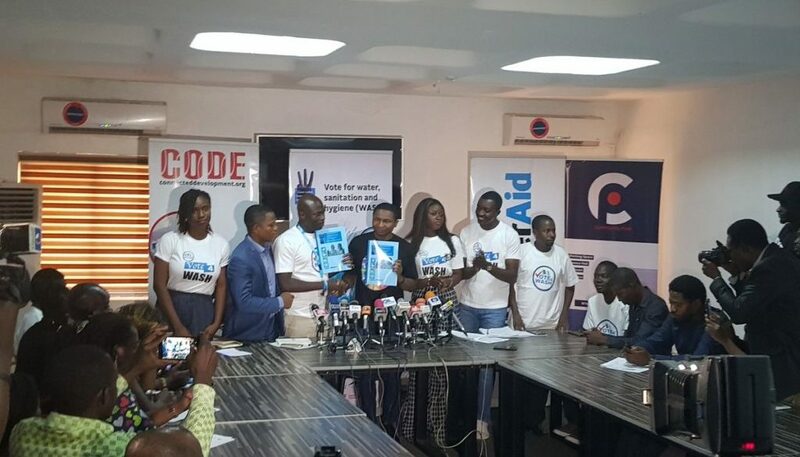 Rising to the challenge, WaterAid in partnership with Connected Development (CODE) are prepared to challenge the status quo especially at the grassroots in Nigeria. Launched in November 2018, #VoteWASH seeks to mainstream WASH in 2019 electioneering campaigns and political conversations at sub-national levels of government where grassroots populations reside. Through #Vote4WASH, we are reaching out to electoral stakeholders – political parties and their candidates for Gubernatorial, Senatorial, House of Representatives and House of Assembly positions; community-based organisations; civil societies; and electorates, to recognize; influence and demand for remarkable budgetary attention and funding for WASH in the grassroots. This is can be achieved by conscientizing electorates to cast their votes only on candidates/political parties who sign up unto Pledge Cards and publicly commit to prioritize programmes, projects and interventions that are pro-WASH (SDGs Goal 6). Pre campaign press conference: Here we would strive to secure buy-in of the media on robust reportage on campaign activities through the life span of the campaign. Mapping of communities affected by severe WASH crisis and preliminary visits: Across the geopolitical zones, selected communities with severe water-related crisis would be mapped and visited for human angle stories and perfection of community penetration processes. Community Outreach: At this stage, we would conduct in-depth interviews with families who are victims of WASH crisis and sensitize/empower community stakeholders on #Vote4WASH. The communities would be armed with accountability tools with which to engage elected officials and track campaign promises post-election wise. High-Level Courtesy Calls: We would map key House of Assembly, House of Representatives, Senatorial and Gubernatorial candidates of leading political parties in Edo, Lagos and Kano states and through strategic engagement, we would have them sign pledge cards – committing to transformative budgetary appropriations and funding for WASH in rural communities upon assumption of offices. Media Engagements – Social Media, offline and online: We would deploy routine and targeted radio programmes, newspaper publications and other applicable media, to drive engagement and conversations among stakeholders in the selected states. Report writing: Among other elements of the campaign, a comprehensive report would be authored on implementation and published for public consumption and it would assume the status of a tool for accountability. Achieving the SDGs is non-negotiable. Goal 6: Ensuring access to WASH for all is a universal, integrated, and human rights based agenda for the prosperity for people and future of our planet. In your community, support #Vote4WASH to free the human race from the tyranny of poverty and deprivations occasioned by WASH-related crisis.